Rooney, who has signed a two-year deal, said he was "ecstatic" and his "first game back will be an emotional day". "It's a great feeling to be back. I cannot wait to meet the lads, get on the training pitch and then get on the pitch to play," he added. Rooney's return comes as United look set to sign Everton striker Romelu Lukaku, with a £75m deal for the Belgium international agreed between the two clubs. "I'm not just coming back because it's the team I support, the team I grew up playing for - I'm coming back because I feel the club can move forward and be successful," said Rooney, who scored 17 goals in 77 games in his first spell at Goodison. "I want to be part of it. There will be pressure on me to perform, but I'm ready to go. I believe I can help move this club forward and be more successful on the pitch." Rooney says when he spoke to Toffees manager Ronald Koeman he "saw it in his eyes that he wanted me to be part of his team". He added: "It was a no-brainer for me and the only place I was going to go." 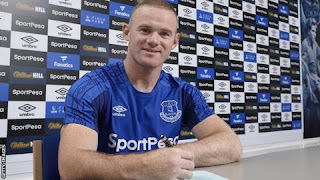 Rooney said he told his agent Paul Stretford to "go and speak to them, let's make it happen" when he found out Everton were interested in signing him and it "was obvious I was going to be leaving Manchester United this summer". "There were other options there but once I knew that Everton wanted me to come back then it was the only option for me," he added.